A secluded oceanfront setting with miles of white, sandy beaches, first class restaurants, shopping, and golf all combine to make your next Pawley’s Island event one to remember. From family gatherings and reunions, meeting retreats or your dream beach wedding exchanging vows with the sand between your toes, allow our knowledgeable staff to help coordinate with a personal touch. Lean on our local expertise of reputable vendors and enjoy the option of full on-site catering for gatherings with singular distinction in a special seaside setting. Our quiet, dreamy beach setting provides the picture perfect backdrop for a cosy oceanfront wedding ceremony. For couples who dream of an intimate gathering on the beach, surrounded by a select few to witness an exchange of vows, with toes in the sand and the sound of the ocean lapping the shore nearby, the Oceanfront Litchfield Inn may just be the idyllic spot for you to begin your happily ever after. Allow our experienced Litchfield Inn staff to assist you while preparing your dream wedding. Having been in the community for over 50 years we have wonderful relationships with local vendors for all of your wedding needs, from photographers, to florists and bakeries. Our variety of room types including two-bedroom villas are the ideal option for accommodating your wedding guests. If you are hosting your wedding ceremony and reception nearby, allow us to host your wedding guests in our spacious, beachfront accommodations. Please call 800-637-4211 to start planning your wedding celebration or to get information on room rates. We look forward to hearing from you. Our 1300 sq ft of meeting space offering a variety of seating configurations, fully equipped with audio/visual equipment for presentations on point, translates to an ideal space for meeting retreats and smaller events. Our attentive staff stand ready to take care of every detail, to ensure your next meeting is perfectly executed. Away from the hustle and bustle, yet still near Myrtle Beach, our quiet beachfront setting is the ideal place for focused productivity away from distractions. 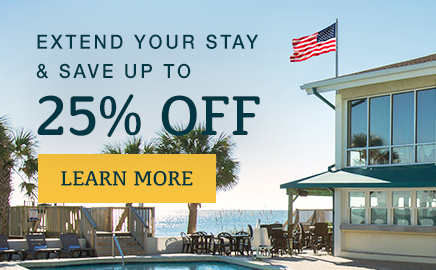 Well loved as Pawley’s Island’s favorite oceanfront hotel, our family-friendly atmosphere has provided a destination for loved ones looking for a quiet, peaceful reunion vacation for generations. Families enjoy spectacular views of the beautiful Atlantic Ocean from spacious, fully equipped suites while being in located close to the excitement of Myrtle Beach.